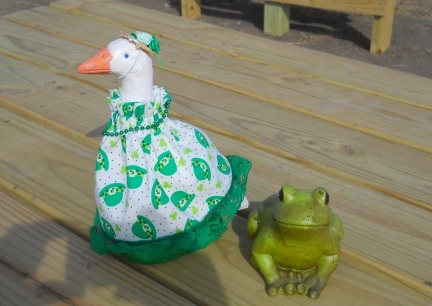 FREE SEWING, CROCHET, KNITTING PATTERNS AND IDEAS TO DRESS UP LAWN GEESE AND LIVE GEESE. To one goose lover a Lawn Goose is/are their live pet goose/geese that live outdoors. 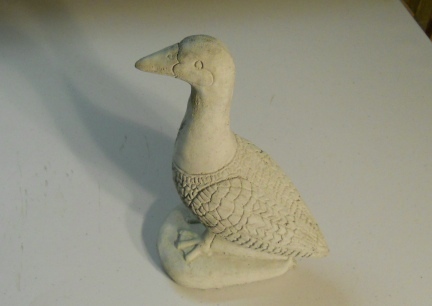 To another person a Lawn Goose is a Plastic or Concrete Goose Statue. 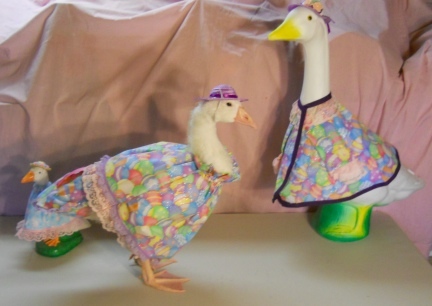 For many a Plastic or Concrete Lawn, Porch or Garden Goose is the only type of goose they can own, but they love their Lawn Goose and dress it in clothes, outfits, costumes, suits and dresses. 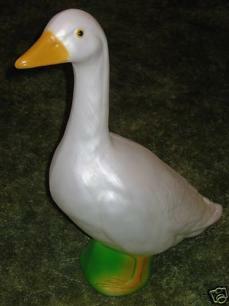 The Concrete Geese became so popular in the 1980 - 1990's many people had/have them to set on your porch and dress up in cute costumes and outfits that someone, somewhere, started making the same in plastic. What I think surprised a lot of people is THEY ARE STILL VERY POPULAR AND JUST AS CUTE TODAY! Some of the outfits are detailed and use expensive fabrics. 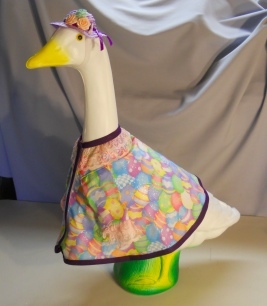 You can find any type of outfit for the goose statue that you might like to dress it in, or you can make the outfits yourself. 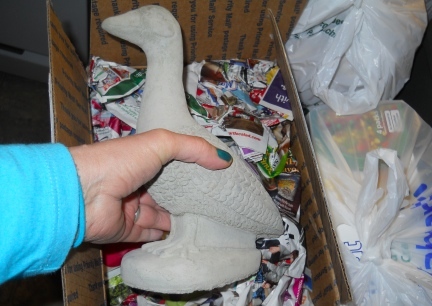 Many of us own indoor, outdoor live geese as well as lawn or porch geese that are made from concrete or plastic that can be filled with sand. Can the clothing fit both the statue and live geese? Ummmmm? Yes. Some can. But size matters. 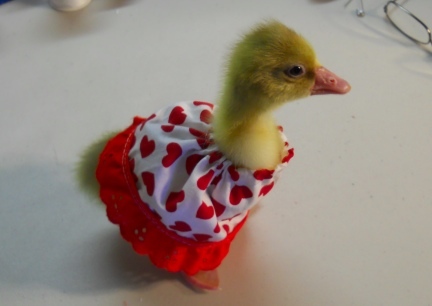 Read below how to Teach your Live Goose to wear Clothing, Outfits, and Costumes. If you are patient you will get really cute photos. Maybe even your next Christmas Card, or Birthday Card photos! Just keep it very safe and fun for the goose. 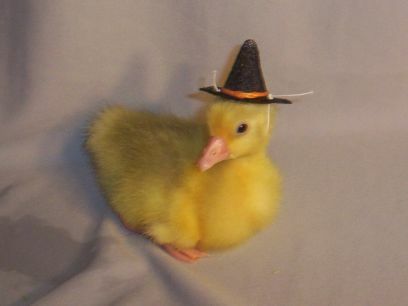 Have treats ready to distract them, and enjoy your time playing dress up with your live goose. How To Make Your Own Basic Lawn Goose Clothing Patterns Free! There are several different sizes of Lawn Geese and even more different sizes of Live Geese. When you make your own patterns you must be sure that you are making the right patterns and using the right patterns for your own goose, Plastic, Stuffed Toy, Concrete or even Live. 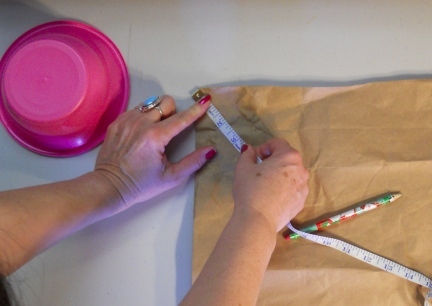 When you make your patterns, have all of the items to create your patterns gathered and together, pencils, bowls, measuring tape, scissors, everything you need. Be sure to create all of the pieces of patterns you need for the project you are making before getting your fabric out to start the pattern. 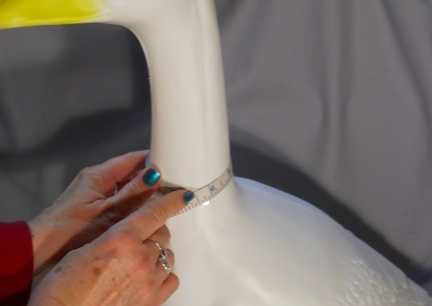 Photos of how to measure your goose, live or plastic, and how to put those measurements to paper and cut them out in fabric, How to place your ribbon and Bows, as well as Lawn Goose and Live Goose wearing the outfits, more photos coming soon! 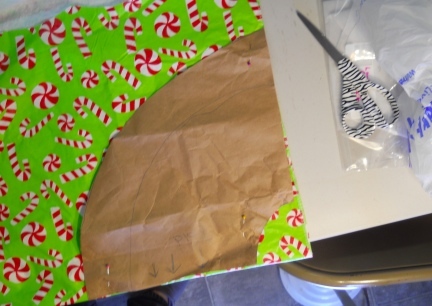 Making your own pattern and designing your own patterns for your geese is not rocket science. 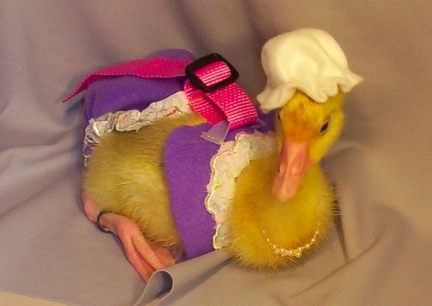 Making your own outfits, costumes and clothing for your geese, is rewarding and fun. 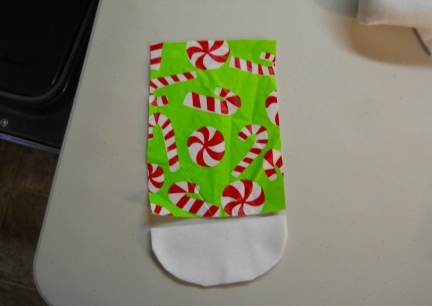 You will need a measuring tape, an empty feed bag or large page of newspaper, two pencils, patients, inexpensive fabric (for your first outfit to check the pattern), hook and loop (velcro brand is the best). I would recommend waiting for the fancy trims and such until you have made your first outfit to make sure it all fits. You can make adjustments on your pattern from there. A sewing machine will make sewing easier then sewing by hand, but this is not a huge project, so you could certainly sew it by hand. 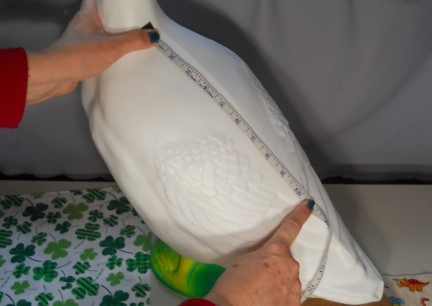 These photos should show you just how to measure your Goose, Plastic, Concrete, Stuffed Animal or Live, for making patterns for clothing for it. Measure your Lawn Goose around the largest area at the base where you want your little outfit to end on your Lawn goose. Then measure from the Lawn Goose's neck to where your outfit will end. 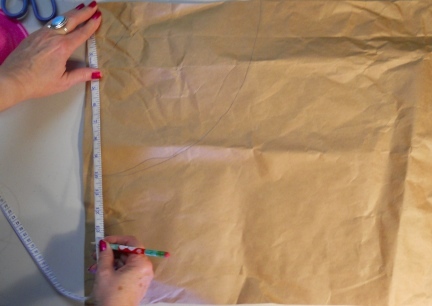 Add 2" to each of those two measurements and cut a piece (start with cheap fabric for your first outfit) of fabric that will look like a rectangle. Stitch the short sides together, when doing so, put the right sides of the fabric facing one another so that your seam is in the inside of our outfit. At one end of the, now tube, outfit, turn the neck area under just a small amount and make a seam. 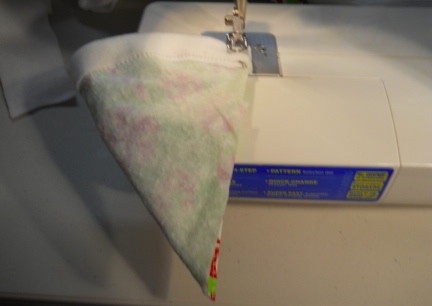 Now fold that same side, where you just sewed, down again to about 1/2" and make a seam, LEAVING A SMALL OPENING, that is, so not sew down that seam to meet up with where you started that seem. 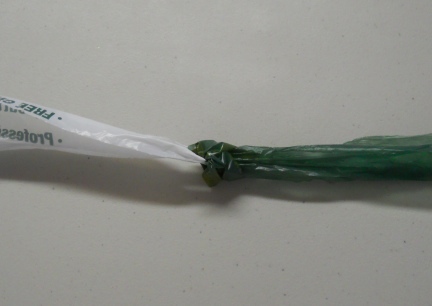 Take a thin piece of elastic and measure it around your Lawn Goose's neck. Cut it to fit, not pulling it tight. Now you will need two safety pins. One safety pin will be placed at the end of our elastic so that you can feed that elastic through the seam you just created approx. 1/2" thick. 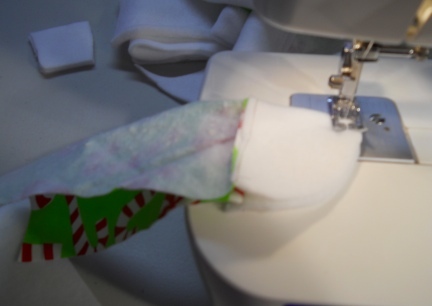 Start that elastic through one end of where you did not finish the seam. When the other end of the elastic gets where it is about to go through the seam, take the other safety pin and pin it so that it stays at the open area. 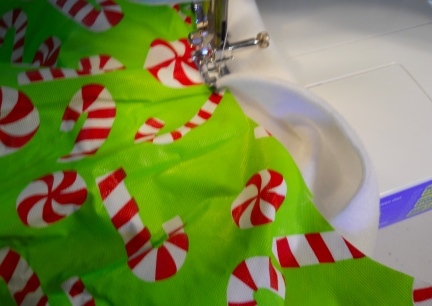 Feed the rest of the elastic through the seam, meeting the other end of the elastic and pull each of the ends (take the safety pins out as you hold on to each end) and stitch the two ends of the elastic down by going over it, back and forth, at least four times. Your neck is now finished. No put a small turn under seam in the other end of your outfit. 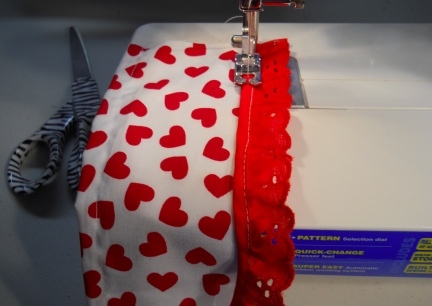 You can add lace or trim when it is finished. Now, slide the outfit, neck side up, over your Lawn Goose. This outfit will probably fit a tame full grown goose for photos. Note: If you want a more full dress on your Lawn Goose make the length of your rectangle 6" - 10" longer then the first called for 3" extra. 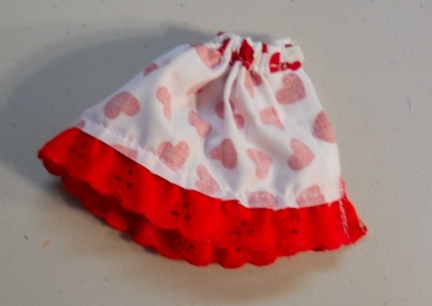 I took the same pattern above, the rectangle pattern and made this little Valentine's Dress for my gosling Dinah Soar. Here are the step by step photos of how to do the directions/instructions above. To make a bit of a collar with this same pattern, put two lines of stitches in as shown in the photos, and run your elastic in between the lines of stitches. 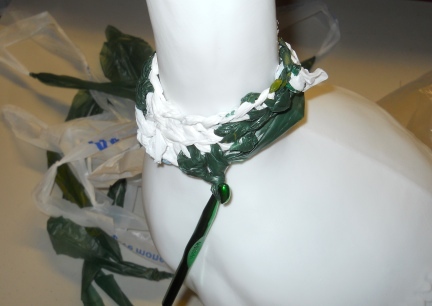 Add a cute little hat and necklace to match and your Lawn Goose is ready to show off for the Holidays. You will need about 1/2 yard of fabric for the "coat/dress" part of the outfit as well as most hats. I recommend for your first outfit, use cheap fabric. 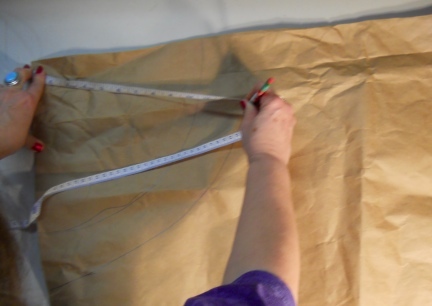 Any fabric will do just to find out if you have the pattern correct or if you need to made adjustments. You do not have to trim the first outfit you make in the cheaper pattern, just make the coat and or hat to make sure the items fit as you understood the patterns and instructions. You will also need a bit of fabric, approx. 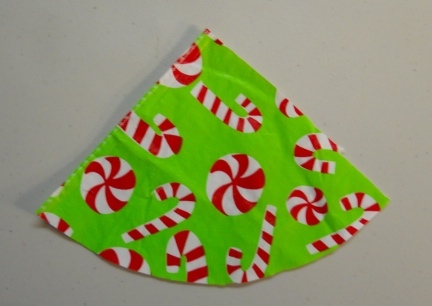 5" x 7" piece of fabric, usually in white or off white, for the wings. I used the 5" x 7" for the matching sleeve then added a couple of inches of white in an arch shape for my wings, or goose hand. You may also want just a little bit of stuffing to give the wings "life". I left mine flat. When you are ready for your second outfit and go to buy your fabric, do not forget to buy your lace, thread, ribbon, buttons or any other trims and such you will want for the outfit you are making. If you buy it all when you buy your fabric, you can make sure it matches right there, right then. THE PATTERN SIZE BELOW WILL FIT A <MOST> LAWN GOOSE BETWEEN 22"-26" TALL. It might also fit most breeds of Live Geese. 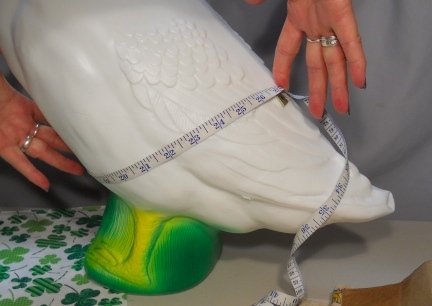 If you goose is a different size, make adjustments to the pattern before making your outfit for your goose. 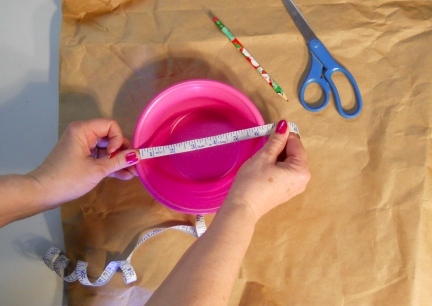 You will need a fabric measuring tape, a bowl that is about 6" in diameter (across the top of it), a large piece of paper, one pencil, maybe two. I used the inside liner of a feed bag to make my patterns. 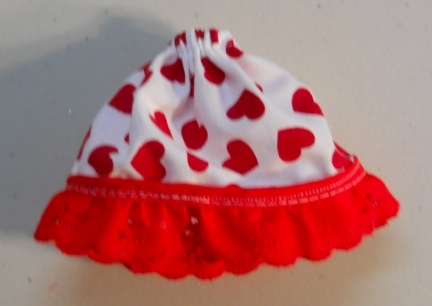 It is free, good grade (thick), and as a pattern you can use it repeatedly without tear and little wear. Gather all of your items together. Measure from the corner in to the middle of what will soon be a circle and mark 3". With your bowl upside down, set it in to the 3" mark and draw around it to make your neck area of your outfit. Measure down from the top of your corner (with the neck piece not cut out yet) 13". Taking your measuring tape, or a piece of string with two pencils, Swing your pencil around making your mark for your outfit bottom. Cut out your neck and skirt areas. 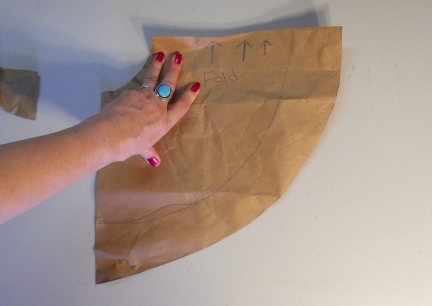 Place your pattern on your fabric with one side as your fold. 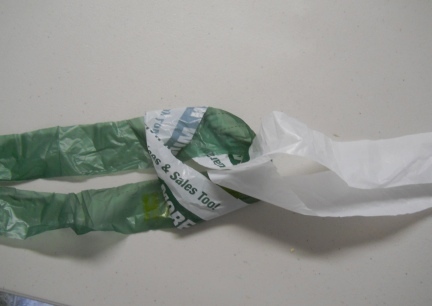 If you fold your pattern over in half longways, one side might be a bit longer then the other. 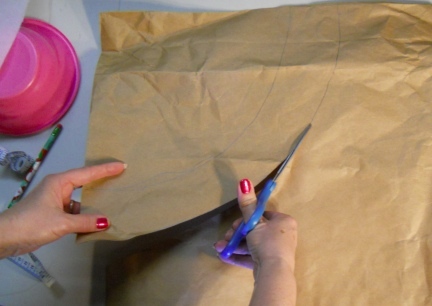 Place the shorter side on the fold of your fabric for cutting. Take your time, enjoy the project. 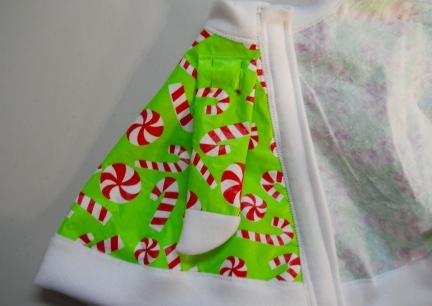 Use cheap fabric for your first outfit so that you can make pattern adjustments as necessary. 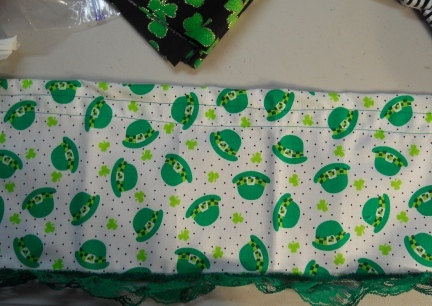 I sewed trim on the first one I made as you see in the photo. I cut the white polar fleece in strips about 4" wide and doubled them over the edges of the outfit. 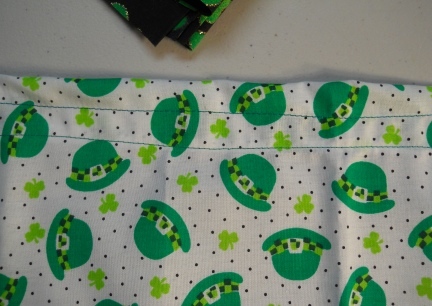 I used a zig zag stitch to be sure to catch all piece as I sewed. 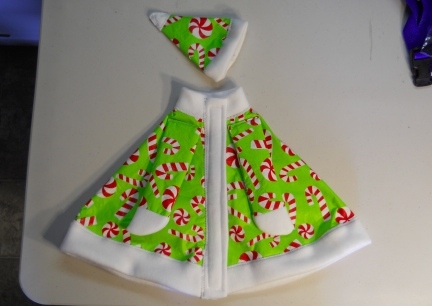 Add a piece of velcro to each side of your Goose Outfits opening in the coat/dress. Be sure to add each piece as it will close. Check and double check to make sure you have your velcro in the right area before sewing it to the coat/dress's sides. 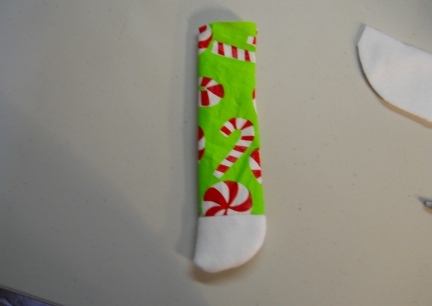 I cut two each of pieces that measured 5" x 7" out of the matching fabric, as well as two approx 3" pieces of white polar fleece. I scooped the polar fleece so that it would become wing/hands when sewed. I sewed the polar fleece to the sleeve before sewing the sleeves, right sides together, starting at the hand, to make each arm. Tuck a small seam down, then add your arms, one on each side of your outfit, as shown in the photo. Pin both arms on so that they are equal and set right before sewing them to the outfit. I then cut a little Santa inspired hat. I just cut it on, or from, the corner of the same fabric as you can see in the photo. 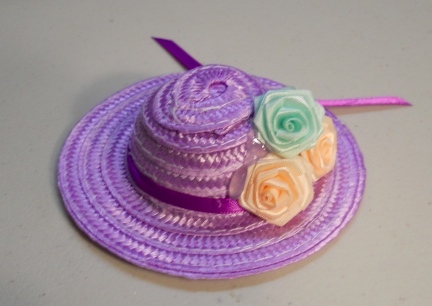 Add your trim to the hat before sewing right sides together and turning it inside out for the goose to wear. 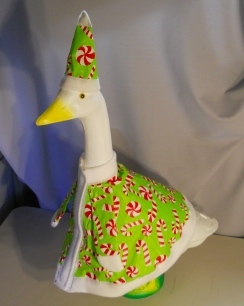 I recommend putting elastic on the bottom so that it stays on the goose's head as it should. This is what my Goose Outfit looks like, yours should be similar. 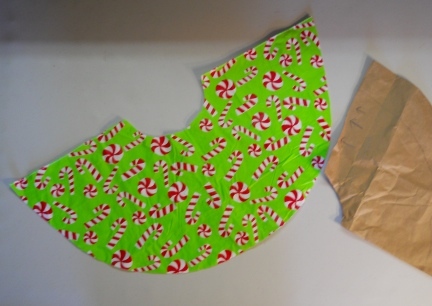 If you still do not understand how to make your own pattern for the measurements and photos here, I will make and sell you a set made with thick Feed Bag paper. This is a pattern I made myself and you still might need to make adjustments to it to fit the goose you are making the items for. It will not look like patterns you buy in the store. I will get them out to you as quick as I can, but it might not be the next day in the mail. 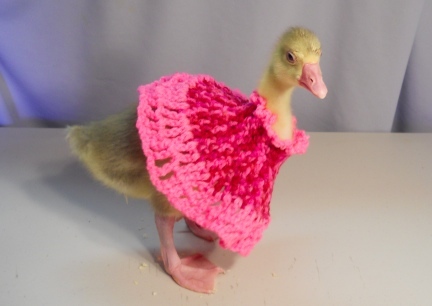 Just email me at marna@HouseGoose.com with "GOOSE OUTFIT PATTERNS" in the subject line. I charge $5.00 for the patterns (for the time it takes to make and cut them out, plus mailing them to you) as well as postage to you. Approx. 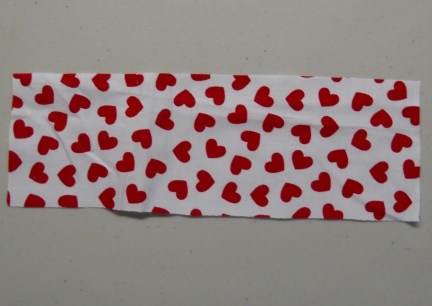 2.50 for USA $5.20, postage charges, for foreign. Every goose, even some of the Lawn Statues, are different sizes. So you will have to measure. Take a tape measure and get two measurements and write them down. Measure the neck at the body as well as the waist of the goose, IN FRONT of the feet. If this is for a live goose, you do not want the sweater outfit to hang down so that the goose will step on or get a toenail caught in the bottom of the outfit. After you have your measurements, using an H size crochet hook, chain the amount of stitches (when held tighter then just hanging, but not taught or tight) the length of the size you have recorded for the neck of the goose you are making the outfit for. NOTE: If you want a cuff type neckline for your outfit, start with a chain, using the H hook, of 10 stitches. 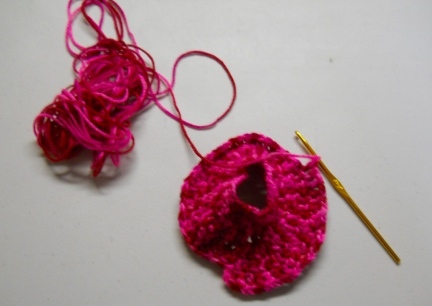 (when crocheting, you will have a line of nine stitches) Continue with a single stitch in only ONE front strand of the piece until you reach the desired length of the neck measurement for your outfit. Slip stitch together and start your round the outfit stitches with a 1 1/2 stitch (you may also use a single stitch or double stitch if you like). From here, each outfit is the same. You will need to do a bit of math to know how many rows will need for you to add two stitches per round for your outfit to fit your goose. On the last row or two you might stitch twice in each previous row of stitching to give a cute edge to the bottom of your outfit. 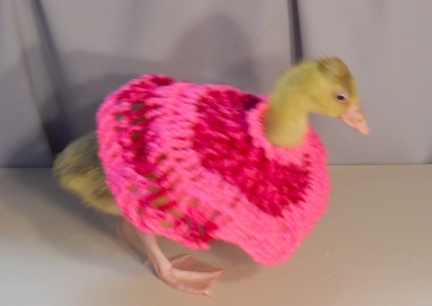 If you are making this for a Gosling, you can grow the dress as the gosling grows by adding stitches to just over 1/2 of the bottom of the dress, as shown in this photo. For you that love geese and crocheting I do have a Stuffed Goose Crochet Pattern and Instructions on our Craft Page at this site. Happy Crocheting. I HATE WASTE! We recylce and precycle and upcycle all kinds of things, and we were doing it before it as KOOOOL. LOL So this pattern below is really fun for me. When finished it is very cute on the Lawn Goose too. 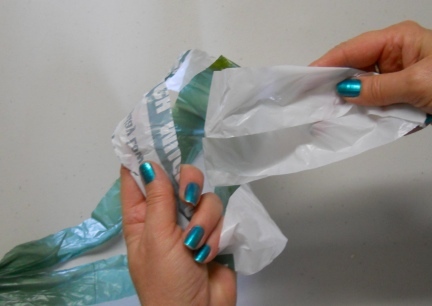 Using all those plastic shopping bags you have tucked away, and you might even need to borrow some from your neighbor. This is a fun project you can feel good about that when finished. You will have a cute and unusual waterproof outfit for your Lawn Goose and have found a wonderful thing to do with all those bags. THIS OUTFIT IS NOT SUITABLE FOR LIVE GEESE! They may just bite into the plastic and or swallow it. You will need several plastic shopping bags to make up your yarn. 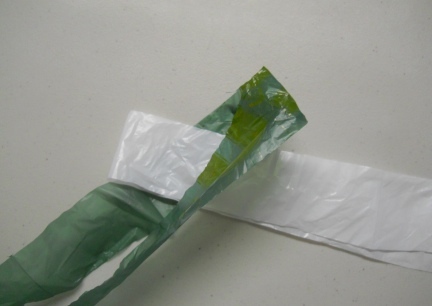 You will cut the plastic sideways at approx 1 1/2" strips, leaving them in a circle. It does not matter if the cuts you make are at exactly 1 1/2" or not, it will work out just fine. 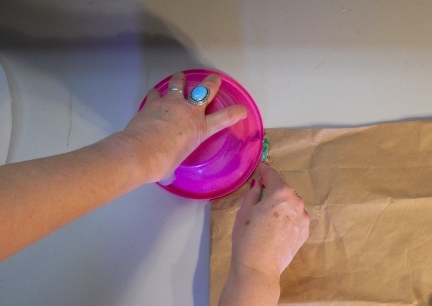 Hook the circles of the strips of bags together to form your plastic yarn. If your bags are different colors and lengths, that is not a problem at all, it will give your outfit more character. 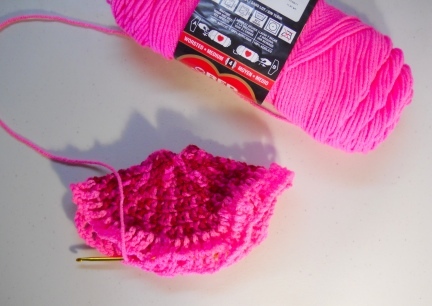 This project will take a bit of time using plastic yarn as compared to regular yarn. Don't be in a hurry, have fun with it. 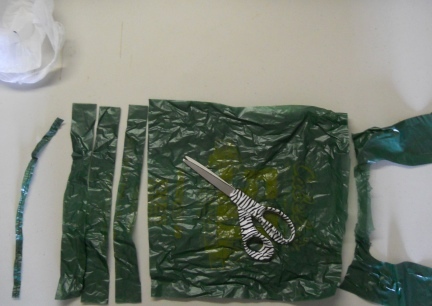 Cut your plastic bags as shown in the first photo below. 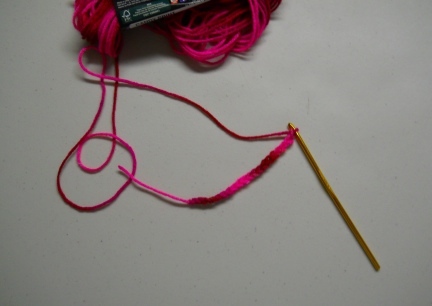 You will have plastic loops, loop your loops together to make your yarn as shown in photos below. I made my plastic yarn as I worked on my goose outfit. I did not cut and make the stand too long to work with and in the way as I worked. This is a project that might take some time. You will hold your arms a bit different as you crochet this project then any other using regular yarn, so you arms may become tired and or sore. Take your time with this project and have fun with it. If you can find different color plastic bags to use for your yarn, all the better. Or you might want to use all one color, the choice of course is yours. This is not a project for a hot day and you might want to lightly powder your hands before working with the plastic. I found that I did not hold the plastic yarn in the same way I hold regular yarn. Try different methods and see what works best for you. Chain 22, slip stitch to join to form a circle, chain 2. Take the circle to your Goose and make sure it will slip over it's head before going on. You might need to add or subtract a stitch or two to your original chain before moving on. Rows 1-3: Hdc in each chain, join, ch 2. Rows 5-7: Hdc in each stitch around, join, ch 2. Rows 9-11: Hdc in each stitch around, join, chain 2. Rows 12-20: Hdc in each stitch around, join, chain 2. Ch 3, 11 hdc in 3rd chain from hook, join to top of chain 3, chain 2. Round 1: Hdc in same stitch as chain 2, 2 hdc in each stitch around, join, chain 2. Round 2: Working in back loops only (only for this round), sc in each hdc around, join, chain 2. Round 3: Hdc in each sc around, join, chain 2. Round 4: 2 hdc in same stitch as the chain 2, 3 hdc in each of next 12 hdc. 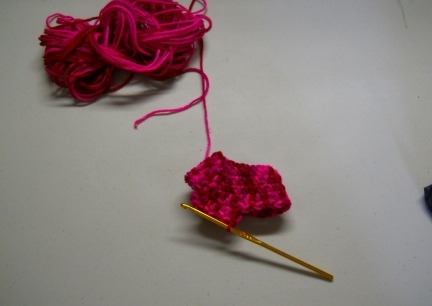 This is a very basic pattern that will be made the same way as the crochet pattern is above. It is a matter of adding stitches as you go along knitting the sweater for your goose. After you make your first sweater you will think of all kinds of ways and stitches to dress this outfit up. Ideas and Instructions for both Lawn and Live Goose Hats COMING SOON. To make yarn hair for your goose you will need more yarn then you might think. There are several ways to make your hair, some as simple as cutting your yarn and making two braids with ties at each end to match the outfit. Even if you can no longer buy the patterns for Lawn Goose Clothing at the Fabric Store near you, you can still buy the patterns on line. Do an Internet Search and you might be surprised what you will find for sale. Most places are not inexpensive, most are retired patterns. You also might find people that are selling their own patterns for a small fee on line. If you are creative, the outfits and ideas are endless of what your own Lawn Goose can wear and you might just have the best dressed Lawn or Live Goose in town. 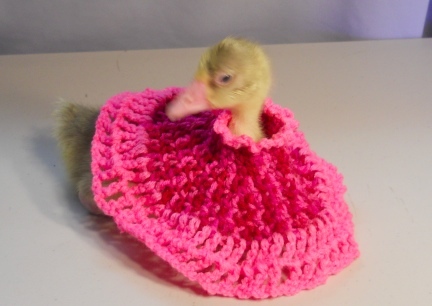 I also plan to sell a few Lawn/Live Goose Outfits in our On Line Store. 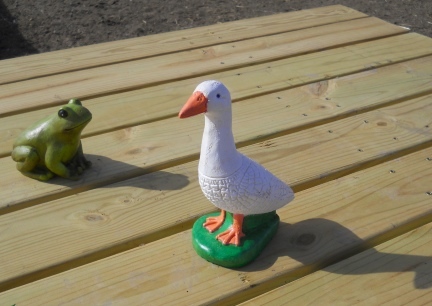 Many times when you purchase your Concrete Lawn Goose it comes unpainted. Cute, but not really as cute as it can be with a bit of paint. Read you paint labels to make sure that the paint you are hoping to use will work for outdoor concrete. I also sealed ours with a clear spray paint sealer when the color paint was dry. 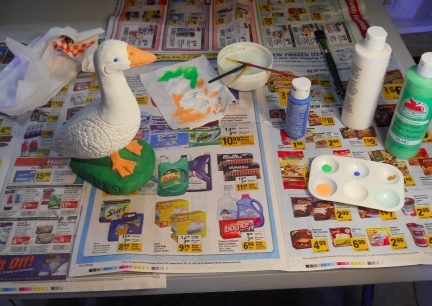 You can paint your Lawn Goose purple with blue polka dots if that is what you want, but if you want your goose to look real, have a look at photos of live geese to give you an idea of the colors you will want. Now and again you might have to repaint your concrete goose to make it look nice. Sun, rain and snow are hard on the outdoor item. I put a base coat on my small Lawn Goose, painted it to make sure all the concrete was covered well. I painted undercolors. Undercolors are the undertones of an animal or item. 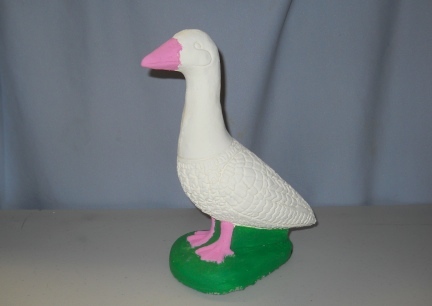 I used pink on the feet and beak, if you look at a goose they might seem to have a bright orange beak, but look around the nose and lips and where the beak meets the face and you will see pink. I used and off white for the body and a dark green for the base. I let that dry for 24 hours then Dry Brushed. I used white for the body, melon orange for the beak and feet and two tones of green on the base. I put a bit of light brown around the nostrils and the feet and legs. I painted the eyes blue with a black pupil. After that was all dry, I sprayed the whole thing twice with a clear over coat. 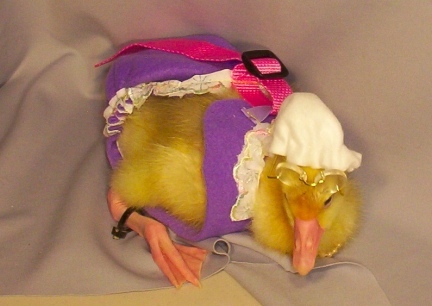 If you have a goose that you have diapered since it was a gosling, you should not have trouble putting an outfit on your live goose. You of course do not want to put anything too tight on your goose. The gosling in the photo is Eden, our HouseGoose. She was so used to wearing diaper holders and hats, that I added the glasses and necklace. She never cared what kind of clothing or accessories I put on her because she always knew I would make a fuss over her when she had them on. If you are planning to dress your goose as an adult, handle your gosling often and touch it all over, feet, neck, head, chest.... Put clothing and accessories on your gosling/goose for just a moment, distract the goose with affection, a toy or even food and or water. Praise the goose in a happy voice. Only leave the item on the goose for a short time. Then repeat. Go about this slow, don't add a hat and skirt and necklace and.... all at the same time. 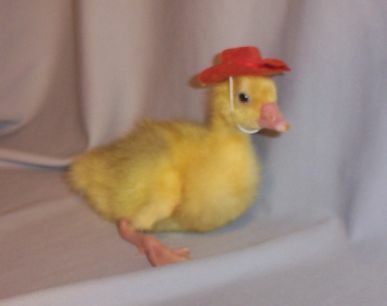 Teach the goose to wear a hat. Then add your outfit. A few days later add a necklace. Make it fun for the goose. NEVER, EVER, LAUGH IF THE GOOSE FLIPS THE ITEM OFF IT'S BODY OR ACTS UP/OUT ABOUT A NEW PIECE. IF YOU LAUGH, IF YOU MAKE GOOD TYPE OF FUSS OVER THE BIRD, IT WILL REPEAT THE BEHAVIOR FROM NOW ON. What you need to do if the bird flips the hat off it's head, is say "No." in a firm voice and put the hat back on the hat, and say "Good." right away. I am NOT A CLICKER FAN. But if a clicker works for you. Use it. The word good is your own unique voice. You can flex it, change the tone, your goose already knows your voice and how you use it. And your voice does not fill up the hands you might need for correction, as in moving the goose, or resetting the goose, or catching something as it falls. Further, you will always, immediately, have your voice at all times, right there ready to use. Many people have no idea how keenly our animals listen to use and read not only our body language, but also the tones and flexes of our voices. So when working with clothing on your goose, keep that happy tone and the word "gooooood" as your training tools. 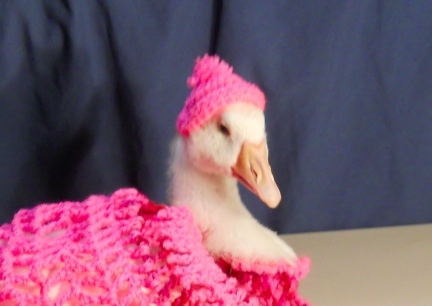 Once your goose dresses up..... you must make sure that whatever you put on your goose it is safe for it to wear. If you have a necklace on the goose, you do not want it too long or the goose will try to eat it. If you are making a goose necklace with beads double the fishing line and fill the entire loop for that A) the goose can not break the necklace and swallow the beads, B) with beads all around the line will not hurt the gooses neck, C) with the shorter necklace length the goose can not get it's beak around the necklace to bite it or pull on it. Make sure, if you goose has an outfit on, make sure the goose can walk in it that is it is not tripping on the outfit or that it's toenails are not getting caught in the edge of the bottom. Also make sure that the goose can lay down and get up while wearing the outfit. The way your goose's body is shaped, this can be a problem. Other tips: Add proper sizes elastic to hats so that they stay on the goose's head if the goose tips it's head. Velco is your friend, use it so that the outfit can come off quick if it gets caught on a toenail or something. 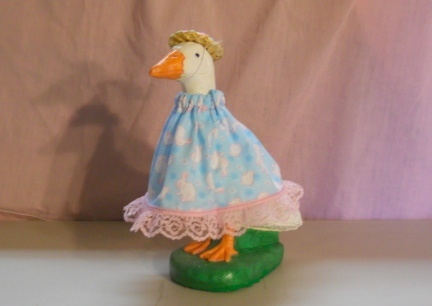 Diaper Holders that are dressy can be just as cute as an overdressed goose. And just like people, sometimes, less is more! Most outfits are for photo sections and short time wear anyway. But keep in mind how it feels and wears (safe) to the goose. Again, and again I will say MAKE IT FUN FOR THE GOOSE TO WEAR THE OUTFITS. Please send us your photos, we would love to show them off here! The contents of this page for Lawn Goose - Plastic or Concrete will probably continue to be under construction. Please check back.